By “mode”, I mean your relative angle and speed compared to the immediate boats around you on the race course. I say immediate because the boats on the other side of the course may have much different breeze and their height and speed may be much different. 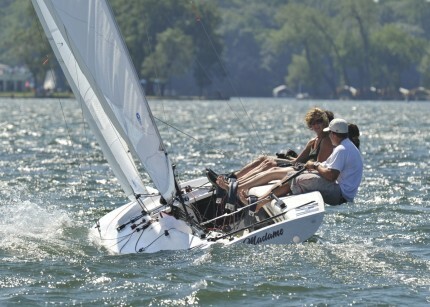 Upwind, you can talk about your mode being “lower height, same speed”, “Higher, slower”, “lower, faster” etc. Of course when you hear or observe that you are “higher and faster”, that is music to your ears. You can also use the same adjectives downwind to describe your mode, but how you adjust your mode upwind or downwind will be much different. And mode adjustments will be different for each boat that you sail on. Scows for example rely heavily on the vang and traveler to depower, and they are often the things that are adjusted first when you find yourself in a “lower, faster” mode. But to adjust your mode with confidence, you have to be comfortable with your base tune which can be found in almost any one-design tuning guide (I would recommend checking out the North Sails OD page for your specific boat as they have very good base tuning guides for almost any OD boat). Adjusting your mode is kind of like hitting a fade or draw in golf…once you can hit it straight, than you can start expanding your arsenal. Normal mode for an E Scow in breeze - main trav down to the rudder post, jib trav down a few inches, vang smoked, leeward shrouds just dancing, and main trimmed to the angle of heel. The biggest factor in knowing your relative mode and being able to adjust it, is to have a designated person looking around and making observations with the boats nearest to you. The area where this is most important is off the starting line and leeward marks where maintaining your lane is critical. On Saturday, we rounded close behind current E Scow National and ILYA Champ Tom Burton and wanted to stay on that tack since it was lifted 10-15 degrees. We decided to go traveler up, softer vang and a little tighter trim on both the main and jib. After a minute, we were able to gain a boat length to whether while maintaining our fore and aft position…all good. As we made our way up the course however, we were much to slow to convert back into our normal mode once we had a safe lane and we found ourselves now sailing higher and slower which allowed the M-9 to gain a few boatlengths overall. Keep in mind the below suggestions can be used independently or together depending on the conditions and the type of boat you are sailing. Lower, Same Speed – Most likely need to power up and try trimming harder. Could be ok in a tactical situation if you are finding yourself getting rolled. Higher, Slower – Most likely need to depower and convert some of your height into speed. More controls like vang, cunningham and backstay and easing the traveler. Easing the sheets slightly and putting the bow down as well. Could be good tactically if you are trying to maintain a lane with the boat to leeward. Lower, Faster – Need to convert some of your speed into height and power up – Less vang, backstay, cunningham. Trav up, slightly tighter trim. Could be ok tactically if you are struggling with the boat to whether. Same height, Same speed – Some days this is a challenge, so take it when you get it. Again, recognizing your mode and adjusting it accordingly can be huge for the little battles you find yourself in during the course of a race. If sailing a slightly higher and slower mode allows you to live in a lane for another 30 seconds and get to a new lane of breeze, than you have pulled off a very difficult manuver. What if you find yourself in the mode of sailing for you and your crews life in 20-25 without the skill to rectify the situation? Thx for the great, particularly timely advice. And have a great regatta this weekend!